PASSION FRUIT SEED OIL (Passiflora edulis) Product Description 100 % Pure and natural - Extracted by cold pressing process This product contains no synthetic ingredients, no artificial preservative, no artificial fragrance. The Brazilian Passion fruit seed oil has a fresh pleasant citric fragrance with calming, soothing and analgesic properties. The passion fruit has been used medicinally for hundreds of years, and its benefits are scientifically documented. It is most widely known for its sedative, anti-inflammatory, analgesic and anti-spasmodic properties. The passion fruit is native to the Amazon. Cosmetic benefits Passion fruit seed oil (passiflora edulis), also known as Passionfruit oil or Maracuja oil, is a superior emollient rich in vitamin C, calcium and phosphorus. The high content of essential fatty acids and light texture of Maracuja Oil (Passion fruit seed Oil) makes it a valuable contribution to a wide array of personal care products intended to nourish the skin and treat dry skin conditions. Passion Fruit seed oil is highly recommended in scalp and hair care products to encourage healthy hair growth and increased vitality. Passion Fruit seed oil is calming and sedating, and is suitable for inclusion in bath care products and products intended to promote relaxation. Its anti-inflammatory, anti-spasmodic and sedative properties make it the oil of choice for use in massage applications and formulations intended to ease muscular aches and swelling. High in linoleic acids, Passion Fruit Seed Oil has healing and antibacterial properties which may be useful for stretch mark, dry, itchy skin and scalp. 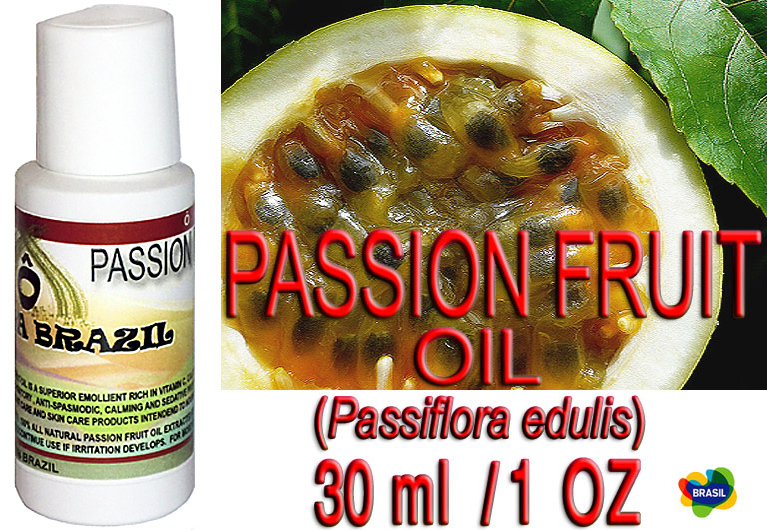 *Passion Fruit Seed Oil will instantly provide freshness and vitality. *Contains anti-oxidants and can be used to improve skin elasticity. *It can also be used in hair softening products and treating dry flaky scalp. *Has a calming and soothing effect on the skin. *High in vitamins A, C and essential fatty acids. Medicinal benefits Passion fruit seed oil is also a rich source of antioxidants. Antioxidants present in this fruit acts as an antihistamine. It is capable of reducing symptoms of asthma by reducing allergy and respiratory tract inflammations. Passion fruit oil can also cure coughs, whooping coughs and help to alleviate brochitis. Amazonian tribes use the passion fruit for centuries as sedatives for reducing pain. In Brazilian traditional medicine, Passion fruit oil is also used to treat depression, panic attack, insomnia, muscle tension, headaches, anxiety disorders, mild urinary infections and increasing libido. It is also used as a sedative in nervous disorders (including gastrointestinal complaints of nervous origin), difficulties in sleeping, and anxiety or restlessness. In studies conducted since the 1930's, its mode of action has been found to be different than that of most sedative drugs (sleeping pills), thus making it a non-addictive ingredient to promote relaxation. Passion Fruit reduces spasms and depresses the central nervous system Passion fruit is rich in potassium (an electrolyte that helps maintain your body fluid levels) and iron. Potassium can help lower your blood pressure, help to maintain muscle energy, aid with arthritic symptoms, control seizures, relieve headaches and promote faster healing. Iron helps to boost your energy level, aids in restful sleep, improves immunity, and most importantly helps transport oxygen through your blood. Passion Fruit Seeds Oil has a fresh, pleasant citric fragrance, with a bright translucid yellow color. This product contains no synthetic ingredients, no artificial preservative, no artificial fragrance. 100% Pure and Natural. Suggested Use * Suncare products * Bath Oils * Massage products Use as a daily moisturizer. After shower, with skin still damp, spread generous amount over entire body, concentrating in the driest areas, rinsing away excess to leave skin dewy soft and smooth. Or massage the oils into the skin for a therapeutic massage experience. When used daily your body will respond to the refreshing and invigorating benefits of Passion Seed Oil. It can be applied to bathing oils, lotions, creams, soaps, hair conditioner, hair masks and shampoos. Concentration for use is between 2 to 7% for both hair and personal care. Shipping Information - We ship WORLDWIDE. - The shipping price above is NOT valid for buyers outside of US. For international buyers, shipping cost varies by buyer location. - All International customers are required to leave a telephone number (required by the post office for international packages). - All items will be shipped to the buyer's PayPal address, so please confirm your shipping address before your purchase. If you want to change your shipping address, please email us ahead of time. We are not responsible for wrong or undeliverable address. - Please note that we currently ship all items via USPS, FEDEX or UPS Ground at our discretion. It will take about 2-6 days to the US and Canada, and 7-10 business days to Europe, Japan, China, Russia, and 10-15 business days to Australia, Middle East, South Africa and Italy. - We combine shipping for you, but we do not combine auction shipments. - No local pickup. - For large quantities please, email us prior to purchasing. - Please contact us if you have any questions about shipping. Payment information - We charge sales tax for items shipped to CA (9.25% or current tax rate). Tax applies to subtotal S H for this state only. All payments must be prepaid. - Payments are expected within 3 days after bidding is closed. Return / Replacement Policy - All items, if returned for whatever reasons, must be accompanied by a Return Merchandise Authorization (RMA) Number, or an email with previous authorization to return the item(s). - Will NOT be accepted return of open packages. - A replacement or refund will be arranged for all defective products returned, subject to verification of defect or any other problem described. Contact Us - If you have any questions, please email info@oca-brazil.com - We have always been doing our best to provide the best service and reliable products for every customer. - Please contact us to resolve the issue before leaving negative feedback. - Thank you for your choice! - Falamos Português / Hablamos Español / Nous parlons Français Do Not Ever Forget: Recycle, Recycle, Recycle!